Tour de France 2014 | Oh Sarah O ! 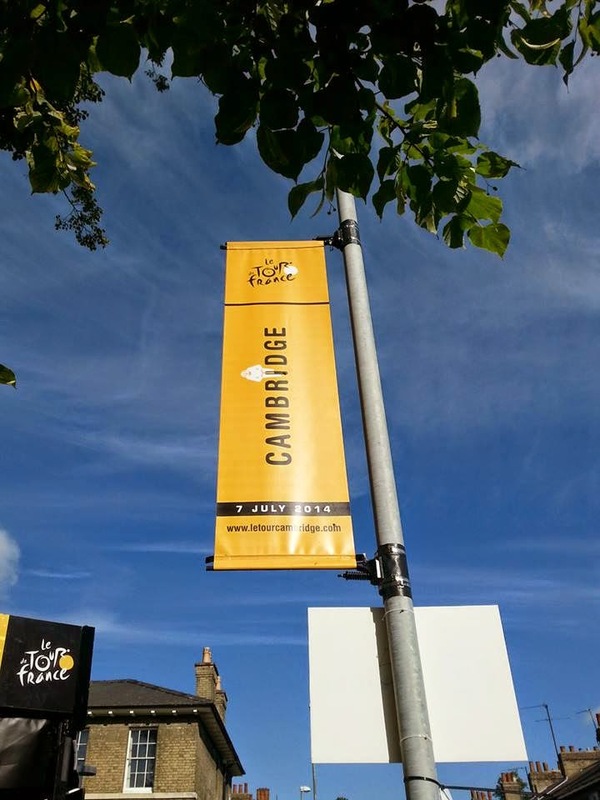 The famous Tour de France bicycle race came to England this year and Stage 3 started in Cambridge, UK (before traveling through Essex and ending at The Mall near Buckingham Palace in London). Even though I've never been a huge follower of the race (a. I don't ride bicycles b. The race typically airs overnight in The States so people typically tape it or watch re-caps of the day's events after they've already happened), I decided to check it out. The Tour de France coincided with Cambridge's Big Weekend festival and french market so I anticipated that there would be a huge crowd so I arrived around 8:30am even though the Tour de France stuff didn't kick-off until 10am and, much to my surprise, it wasn't very crowded and I was able to grab a spot right in front of the signature stage where all of the riders would have to sign-in to participate in the race. Eventually the crowds came and there was entertainment in the form of magical acts, video re-caps from previous Tour de France races and the previous stages, and there were three announcers who introduced everything and interviewed members of the crowd. Later, the junior Tour de France racers were introduced and there was a parade of all of the race sponsors and vendors for before the racers finally came out to sign-in at the podium. The atmosphere was great and it was fun to see so much of the city get into celebrating the races. I definitely felt like this was a once in a lifetime opportunity for this Kansas girl.